When Jimmy turns sideways with his big ears pointing forward, he looks like a unicorn. Looking out my back door a few years ago, I first saw the mythical creature atop a nearby pasture hill. Standing in profile, he looked like a gallant, white stallion with a single horn shining in the sun. "Come here, Don, and look at this. Lohts got a unicorn!" My husband never gets excited or plays along. "Looks like a horse to me." It was a few days before I walked back to get a closer look. The equine could hear us coming before I could see him, and began to snort loudly. By the time I reached the top of the hill, he was as far away as he could get, still snorting a warning. Who was this noble steed? My Aunt Mary explained on the way to choir practice. Jimmy was a donkey acquired as a pet for their youngest grandchildren - Brady and Emma - but it was not working out so well. Likely mistreated at some point in his life, Jimmy wanted nothing to do with humans including the two kids. 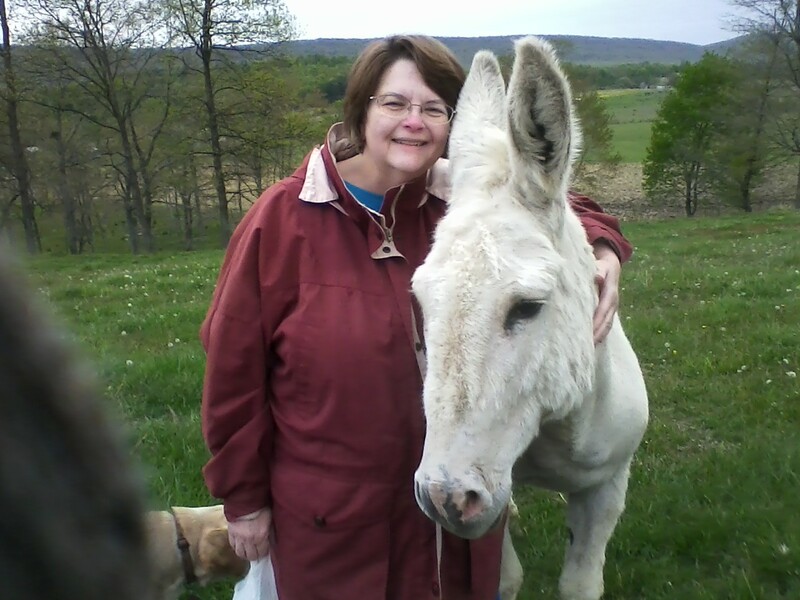 Jimmy has a lovely pasture, a sturdy barn, a pond, and all the grass he can eat, but he is a lonely donkey. Sometimes cows are pastured with him and he enjoys their company. But before long they return to their Amish farm, and Jimmy is living solo again. Uncle Donny brought in some female donkeys for a while, but Jimmy was rough, and they had to be kept apart. Now they are gone. So I've made it my mission to befriend Jimmy. Figuring that the way to win him over is through his stomach, I checked with Emma after Church as to Jimmy's favorite treats. "Bananas and jelly beans," she said. It wasn't hard to rope my mother into this with me. The wonderful weather, daylight saving time, and a lonely donkey have all combined to give us something to look forward to at the end of the day. For the past week, as soon as I hop out of my car, I am on the phone with Mom telling her to be ready in 10 minutes. At age 80, with bad knees and an artificial hip, she is still up for a long walk over rough terrain using her cane to steady her. What a thrill when we crest the hill and scan the pasture for him! We call his name and throw treats - a corn cob, apple, banana, or carrots, foregoing jelly beans in concern for his dental health. Jimmy approaches with the stealth of a Navy Seal, weaving back and forth, spontaneously retreating, snorting, and kicking up his back legs. But we are making great progress! He is already coming within ten feet of us. One day I hope to touch him... without losing a finger.